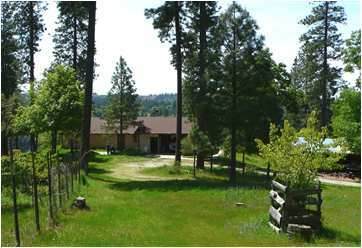 Our peaceful home in the Sierra Nevada foothill community of Mosquito. 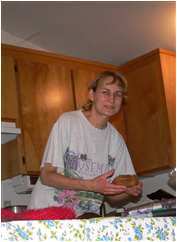 Diana enjoys gardening and experimenting in the kitchen while Fred does laps around the house before going back inside to do computer work. A visit with Daniel and Emily, flying with Daniel for the first time, fun with friends. 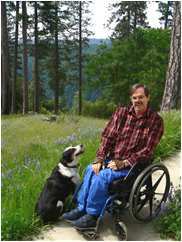 Insights about why God allowed Fred to become a quadriplegic, with pictures. Fred on the TracAbout pulling a log, hauling firewood and other fun stuff that goes on at our place. Fred's first web page. Still learning too! Riding a 1930 Model A Ford, splashing through mud puddles, exploring ruins of an old resort, picking berries & more! TracAbout - my tractor chair! A fantastic tractor chair takes Fred to places no wheelchair can go! A tasty, healthful way we get our daily vitamins & minerals. Created by Jim Conrad. General principles about home canning. By Jim Conrad.